CADILLAC, Mich., March 18, 2019 /PRNewswire/ -- AAR (NYSE: AIR), an independent provider of aviation and defense aftermarket solutions, has been awarded a $10.8 million order from the U.S. Air Force for the production of 463L cargo pallets. The cargo pallets will be manufactured at AAR's Mobility Systems business unit in Cadillac, Michigan. "AAR continues to provide this crucial, strategic asset to the U.S. Air Force to ensure it meets its worldwide operational requirements," said Lee Krantz, Senior Vice President, AAR Mobility Systems. "As a trusted source, AAR is proud to provide the 463L pallet to the U.S. Armed Forces, its allies and other U.S. Government agencies." AAR continues to be the world leader in the design and production of the cargo pallets. The 463L USAF design uses a lightweight balsa wood core that continues to provide unparalleled strength-to-weight performance and reliability compared to alternative commercial pallet designs. 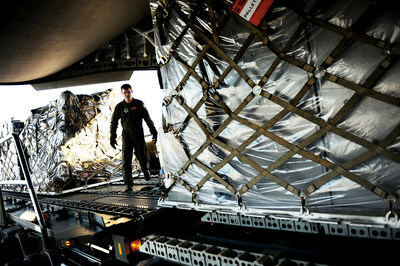 The pallets are designed to be loaded and off-loaded on a variety of military and commercial aircraft. AAR is a global aerospace and defense aftermarket solutions company that employs more than 6,000 people in over 20 countries. Headquartered in the Chicago area, AAR supports commercial and government customers through two operating segments: Aviation Services and Expeditionary Services. AAR's Aviation Services include parts supply; OEM solutions; integrated solutions; maintenance, repair, overhaul; and engineering. AAR's Expeditionary Services include mobility systems and composite manufacturing operations. Additional information can be found at www.aarcorp.com. AAR Mobility Systems is a division of AAR and a leading global supplier of rapid deployment equipment, including mobile tactical shelters, pallets and expeditionary containers that enhance the military's ability to mobilize, deploy, maneuver and sustain forces. AAR Mobility also manufactures large lightweight structural assemblies and platforms that support mission essential functions. Products are supported through a network of service centers, field service teams and strategic partners. More information can be found at www.aarmobilitysystems.com. This press release contains certain statements relating to future results, which are forward-looking statements as that term is defined in the Private Securities Litigation Reform Act of 1995. These forward-looking statements are based on beliefs of Company management, as well as assumptions and estimates based on information currently available to the Company, and are subject to certain risks and uncertainties that could cause actual results to differ materially from historical results or those anticipated, including those factors discussed under Item 1A, entitled "Risk Factors", included in the Company's Form 10-K for the fiscal year ended May 31, 2018. Should one or more of these risks or uncertainties materialize adversely, or should underlying assumptions or estimates prove incorrect, actual results may vary materially from those described. These events and uncertainties are difficult or impossible to predict accurately and many are beyond the Company's control. The Company assumes no obligation to update any forward-looking statements to reflect events or circumstances after the date of such statements or to reflect the occurrence of anticipated or unanticipated events. For additional information, see the comments included in AAR's filings with the Securities and Exchange Commission. Jeffery Jackson, Vice President of Business Development, at jeffery.jackson@aarcorp.com | +1.231.779.4829.